September is here and looking at the calendar, life is about to get crazy. From school to activities to meetings, time is a bit limited. Anything to simplify our lives, we’ll take it. Like SPUD. My friends have raved about SPUD and how wonderful it is. Thanks to SPUD, I was able to try it out for myself and have to agree – it’s pretty awesome. You do all your shopping online at your convenience, which is perfect because sometimes I can’t get onto my computer until the kids are in bed. You pay online and they drop off a reusable box on your delivery day. 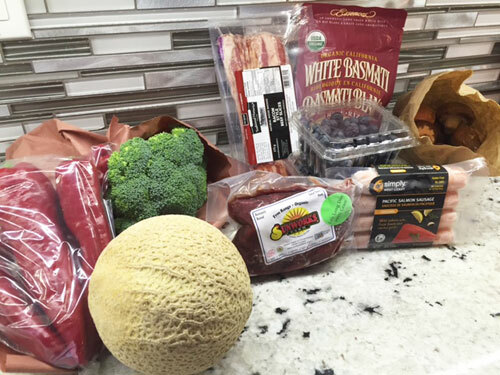 They pack the products really well, so all the refrigerated and frozen items are in insulated bags with ice pouches. Not only does SPUD make life easier for you, they make things easier on the environment by partnering with local producers and farmers. I love that on the website, it shows how far each product travels to get to you, helping you to buy local. Not only do they have the necessities like fruits and veggies, they have some great products like salmon sausages and beef bacon. Of course, we tried both (so good!). Try out SPUD for yourself. If you are in a SPUD delivery area, use this code to save $20 off your first order: CRCAL-JADFAA. One of the things I made using ingredients from my SPUD order and from my garden is Akni. 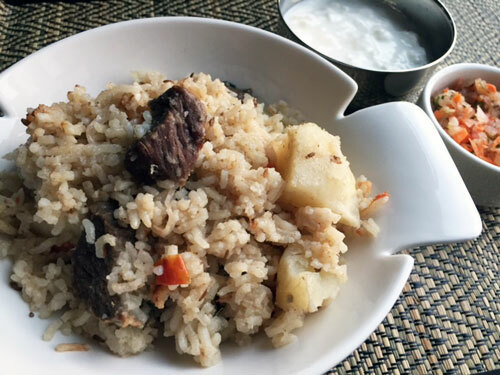 Akni is an aromatic rice dish made with either chicken or beef. Influenced with East African and Indian flavours, it is full of flavour and easy to make and is one of those dishes that are perfect for feeding a crowd. This goes great with yogurt and onions. In a large pot, add the first six ingredients. Bring to a boil and then turn the temperature to medium and let it simmer for about an hour, until the beef is tender. If you use a pressure cooker, this can be done in less than 20 minutes. Be sure to reserve the stock. While the beef is cooking, soak the rice in water. In a large pot, heat some oil and cook the onions. Add the spices and cook until the onions are translucent. Add the meat and cook for a few minutes. Add the drained rice and 4 cups of reserved stock/water. Add salt, potatoes and a sprinkling of cilantro leaves. Cover the pot and cook on medium heat until the water is absorbed. Place the rice in a 300 degree oven for 20 minutes until the rice is completely cooked. I was very excited about the release of another “A Spicy Touch” cookbook. 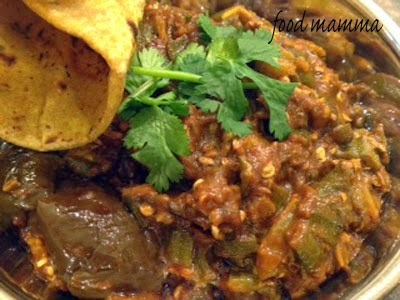 This is the food that I grew up with – Indian food with East African influences. Noorbanu Nimji’s books have been a staple in my house and of most people that I know. They are a great reference for even the most experienced home cook. I was especially excited for this new book since it was co-authored by my friend, Karen Anderson. This book is beautiful with pictures of mouth-watering food. I especially like the pictures of the different spices and the step-by-step instructions. 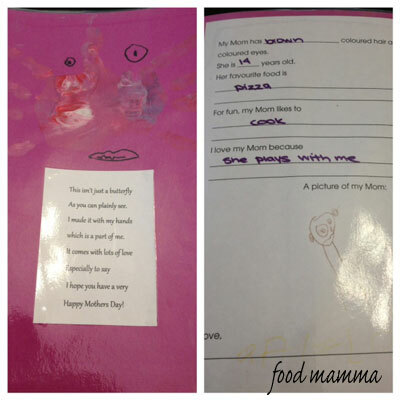 The pictures help make it easy to know what to look for in the grocery store. 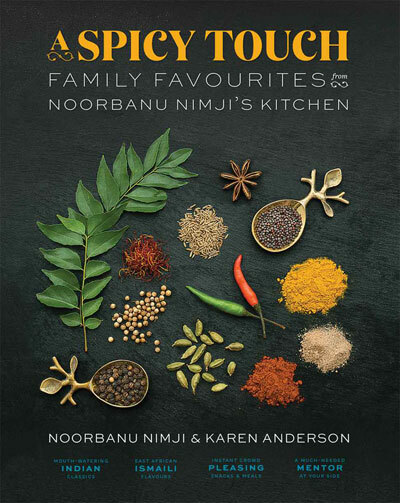 The book is hard cover and would make an excellent gift for any foodie! I love how this fourth book incorporates stories and tips – it is definitely my favourite of the series! Check out the website for more info. 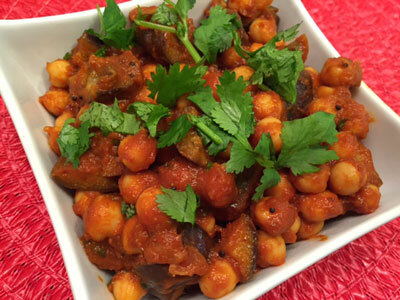 This recipe for Chana Wagharia was super easy to make and was a hit with all the boys. I was happy that I had most of the items in the pantry and took less than 30 minutes to make. Heat the olive oil in a saucepan on medium heat and add the curry leaves and mustard seeds. Cook covered until the seeds pop – about 1 minute. 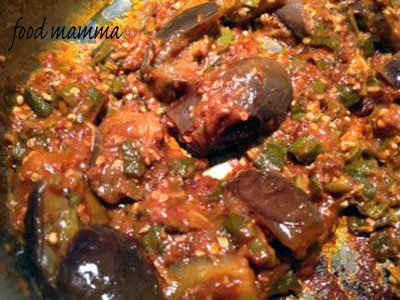 Stir in the tomato, eggplant and salt and cook on medium-low heat – adding a little water if necessary – until eggplant is almost cooked, about 10 minutes. Stir in the cumin, turmeric, coriander, sugar and chili powder and cook for 4 to 5 minutes more or until the eggplant cubes are cooked and tender when pierced with a fork. Stir in the chickpeas, Ambli Ni Chutney or lemon juice and simmer for another 5 minutes. The gravy should cover the chickpeas and eggplant. Stir in the coriander leaves just before serving. 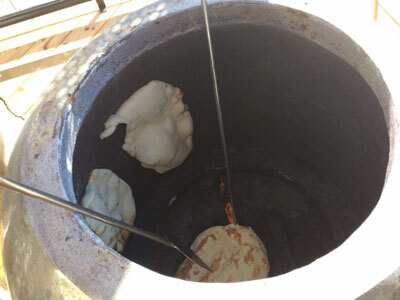 When we purchased a tandoor a couple years ago, one thing we wanted to work on was a good naan recipe. It needed to be fast, it needed to be tasty and it needed to stick well to the side of the clay oven. It’s been fun trying out various versions of naan in the tandoor. 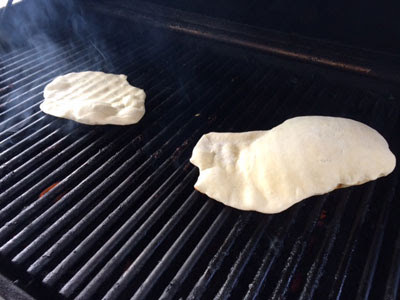 Doughs with eggs that were nice and smooth were finicky in the tandoor. Doughs that I thought for sure wouldn’t work well were the ones that worked the best. After a lot of trial and error, we discovered the best recipe. 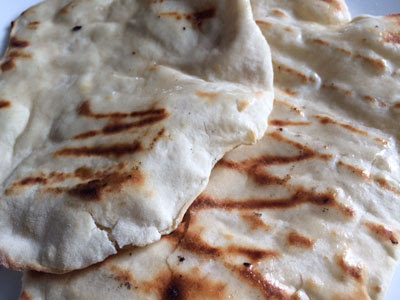 This naan recipe is very simple and doesn’t need a lot of rising time. Perfect when you want to make a batch at the last minute. Don’t worry, you don’t need a tandoor to enjoy these. We tried these on the grill over the weekend and they turned out great! In a mixer bowl, dissolve the yeast in the water along with some sugar. Let it sit for about 10 minutes until it’s frothy. Add the remaining ingredients and knead the dough using the kneading hook. Place the dough in a warm place for about 20 minutes covered with a moist cloth. Divide the dough into eight balls and roll them out. They can be done either on the tandoor or the bbq. They should only take a few minutes a side. Remove and butter the naan. I am excited to be participating in the Hidden Valley Gluten-Free Challenge. Using Hidden Valley Ranch dressings, I was to come up with a gluten-free recipe for the holidays. The first thing that came to mind were vegetable pakora. 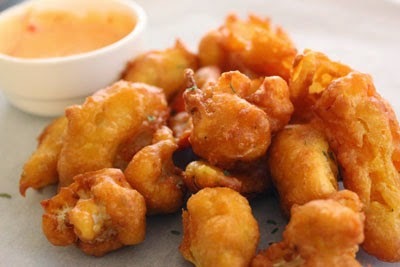 Using chick pea flour and the Spicy Ranch dressing for flavour, I coated vegetables like cauliflower, red pepper and onions with batter and fried them until golden brown. 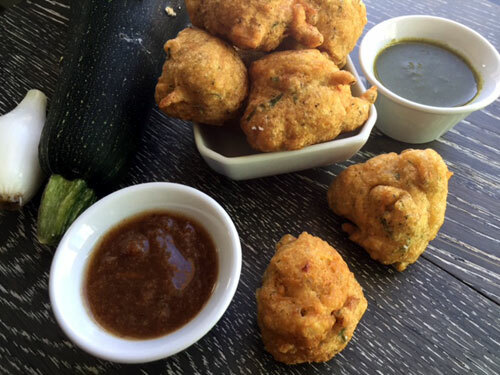 The resulting pakora were a hit and even got my 6 year old to eat his veggies without complaint! 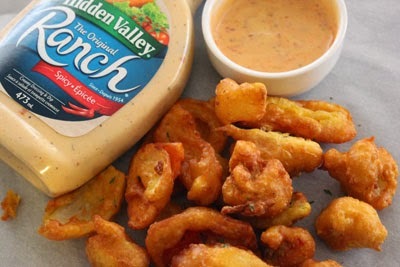 To make the dressing go even further, I added some garlic chili sauce to the Spicy Hidden Valley Ranch dressing. This was the perfect dip to serve with the pakora. This would be a great appetizer for holiday entertaining because it caters to not only those who are looking for gluten-free items but also the vegetarians in your life. Mix all the ingredients together except for the vegetables. Once combined and the batter is nice and thick, coat the vegetables and fry until golden brown. Today we celebrated Eid Al Adha, also known as the Festival of Sacrifice. It seemed appropriate to have lamb and a great excuse to try out a recipe I had been eying. 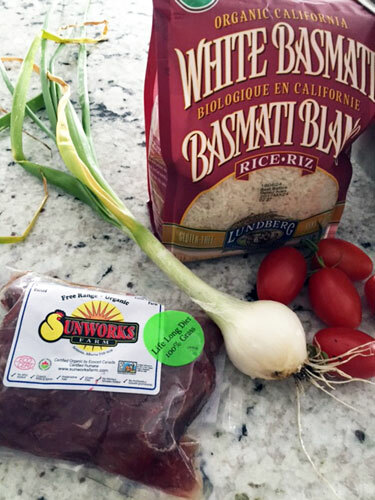 Most people who know of Vikram Vij know that the dish he seems to be most associated with is his lamb popsicles in a fenugreek cream curry. I had been meaning to make it for a while and luckily remembered this recipe the last time I was at the grocery store. I was unable to find a whole rack of lamb but was lucky to find some individual chops. The recipe seemed easy and even with a couple of sides, dinner came together really quickly. The highlight of the meal was the vibrant yellow fenugreek sauce. 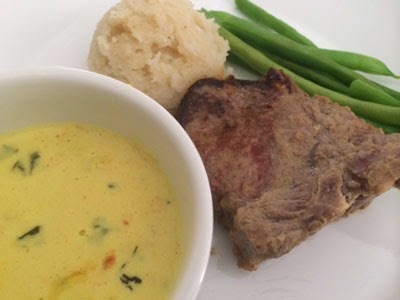 It paired perfectly with the lamb chops and even worked with the mashed potatoes and green beans. It was a really tasty meal and definitely a special one to celebrate Eid. I’m also very happy to have a jar left of the creamy sauce. Combine wine, mustard, salt and pepper in a large bowl. Add lamb and coat well with the marinade. Cover the bowl with plastic wrap and refrigerate for 2 to 4 hours. Finish lamb: Preheat a stove-top cast iron grill or barbeque to high heat. Place lamb on the grill and cook for 2 to 3 minutes per side. In a large bowl, combine cream, salt, paprika, cayenne, fenugreek leaves and lemon juice. Heat 3 to 4 Tbsp of the oil in a medium pot on medium heat and sauté garlic until golden. Stir in turmeric and cook for 1 minute. Stir in the cream mixture and cook on low to medium heat for about 5 minutes, or until it is gently boiling. To serve: Serve popsicles piping hot off the grill. Place four to five lamb chops on each plate. Pour the cream curry over the meat or ladle it into a small bowl and use it as a dipping sauce for the popsicles. I’m not one for resolutions but meatless Monday is something that we are trying to implement around here. It’s not too hard to go meatless especially when it’s so easy to whip together a pasta or a big pot of soup. This week, we decided to go Indian. There are so many vegetarian options and the Indian flavours make you almost forget that you’re skipping out on the meat. This curry is super easy to put together. Two vegetables and a few items from the pantry and you’ve got yourself a tasty meal. In my case, I’ve also got myself a happy hubby, who sometimes complains that I don’t make enough Indian food. Heat oil on medium heat so that it covers the bottom of a pan. Add the okra and let cook until golden. Stir occasionally, so that it doesn’t stick to the bottom of the pan. Combine the tomatoes, paste, and spices. Make little exes on the eggplants and fill them with a little bit of the spice mixture. Once the okra start looking golden, add the onions and the remaining spice mixture. Add the eggplants along with a few tablespoons of water. Cover and cook over low heat until the eggplant are tender and start falling apart. Add water if necessary. 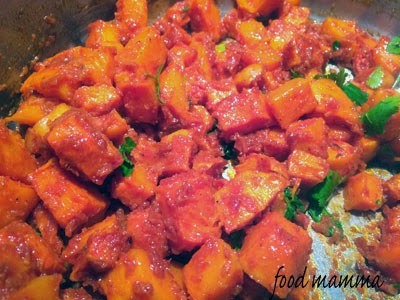 Top with cilantro and serve with chapati. I’ve been trying to keep the fridge stocked with cut veggies, so that there are always healthy snacks on hand. The carrots and broccoli and the snap peas and red peppers, are all happily enjoyed, being dipped in hummus or yogurt. The cauliflower always seems to get left behind. I was tempted to make the cauliflower bread sticks but knew Indian flavours would make hubby pretty happy. I played with the flavours and the end result was a success! The fragrant veggies are perfect eaten on their own or with a bowl of basmati rice. Heat some oil in a pan and add in the mustard and cumin seeds. 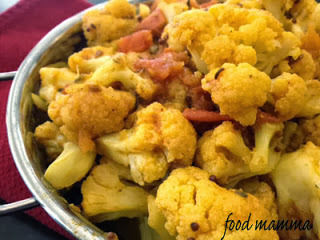 When they start popping, add in the cauliflower, tomatoes and spices. Stir so that the cauliflower is well coated. Add the water and cover with a lid. Cook until the cauliflower is tender and the water has evaporated. On Saturday, hubby and I headed to Banff for the Rocky Mountain Wine and Food Festival. It was a lovely day to go and we enjoyed some amazing food. 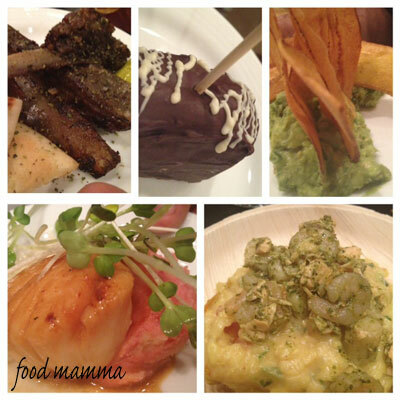 Lamb, Scallops, Plantain, Chocolate Dipped Baklava, Seafood Risotto – it was amazing! The next morning Q came running into my room with a bag full of presents, some things he had bought me, some he had picked out from his toy collection. He has the biggest heart ever! We had invited our families over for a Mother’s Day brunch. This year, I wanted to do something different, something a little Indian. I figured it would be a nice surprise and a slight change from the eggs we were considering doing. I decided on paya, a favourite for both moms. 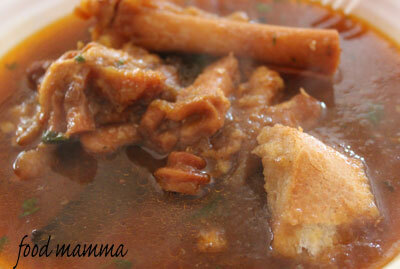 Paya is an Indian/Pakistani dish made with goat trotters. The flavourful broth is eaten with french bread and then the marrow from the bones is eaten. I find that people either love it or hate it. Hubby didn’t want me to work too hard but this was the easiest of meals. I tossed everything into a slow cooker the night before and it was ready to go in time for brunch. The meal was a success and it was minimal effort for a lot of praise. Wash the trotters really well and place in a slow cooker. Add the onions and spices, except for the paprika and cover with enough water. Let cook for 8 to 10 hours on low. Right before serving, add the paprika, enough to get the desired colour. Sprinkle with cilantro and serve with french bread.